In a little more than two weeks my second cookbook, Everyday Happy Herbivore, will be hitting shelves. To get you excited for her arrival, I'm sharing a few recipes here on the blog. First up was my Sweet Potato Dal and now -- Skillet Refried Beans! 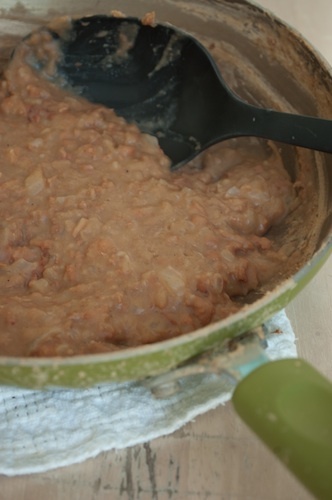 Sure canned refried beans are easy, but you just can't top the taste of homemade. The little effort required here is so worth it -- these beans are fantastic! Line a skillet with a thin layer of water and saute onion over high heat until translucent and most of the water has cooked off. Add cumin, chili powder and a few dashes of paprika, stirring to coat the onions. Add beans with their juices and stir to combine. Reduce heat to low and mash beans well using a fork or potato masher. It will look very soupy, don't be alarmed. Crank the heat up to high and bring to a boil. Once boiling, reduce heat to medium and simmer 10 minutes. If the beans start popping and splashing, cover for a few minutes, then uncover. Stir every minute or so, scraping along the bottom to lift the beans. After 10 minutes the liquid should have significantly reduced. It may still be a little soupy, that is alright, it will thicken as it cools. However, if its really soupy, cook longer. Add salt and pepper to taste, then serve.